One day in 1908, when my presidential term was coming to a close, Father Zahm, a priest whom I knew, came in to call on me. Father Zahm and I had been cronies for some time, because we were both of us fond of Dante and of history and of science—I had always commended to theologians his book, "Evolution and Dogma." He was an Ohio boy, and his early schooling had been obtained in old-time American fashion in a little log school; where, by the way, one of the other boys was Januarius Aloysius MacGahan, afterward the famous war correspondent and friend of Skobeloff. Father Zahm told me that MacGahan even at that time added an utter fearlessness to chivalric tenderness for the weak, and was the defender of any small boy who was oppressed by a larger one. Later Father Zahm was at Notre Dame University, in Indiana, with Maurice Egan, whom, when I was President, I appointed minister to Denmark. On the occasion in question Father Zahm had just returned from a trip across the Andes and down the Amazon, and came in to propose that after I left the presidency he and I should go up the Paraguay into the interior of South America. At the time I wished to go to Africa, and so the subject was dropped; but from time to time afterward we talked it over. Five years later, in the spring of 1913, I accepted invitations conveyed through the governments of Argentina and Brazil to address certain learned bodies in these countries. Then it occurred to me that, instead of making the conventional tourist trip purely by sea round South America, after I had finished my lectures I would come north through the middle of the continent into the valley of the Amazon; and I decided to write Father Zahm and tell him my intentions. Before doing so, however, I desired to see the authorities of the American Museum of Natural History, in New York City, to find out whether they cared to have me take a couple of naturalists with me into Brazil and make a collecting trip for the museum. Accordingly, I wrote to Frank Chapman, the curator of ornithology of the museum, and accepted his invitation to lunch at the museum one day early in June. At the lunch, in addition to various naturalists, to my astonishment I also found Father Zahm; and as soon as I saw him I told him I was now intending to make the South American trip. It appeared that he had made up his mind that he would take it himself, and had actually come on to see Mr. Chapman to find out if the latter could recommend a naturalist to go with him; and he at once said he would accompany me. 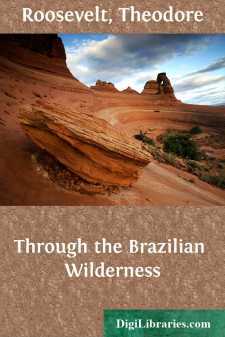 Chapman was pleased when he found out that we intended to go up the Paraguay and across into the valley of the Amazon, because much of the ground over which we were to pass had not been covered by collectors. He saw Henry Fairfield Osborn, the president of the museum, who wrote me that the museum would be pleased to send under me a couple of naturalists, whom, with my approval, Chapman would choose.